Three women, all local African-American playwrights–Kasi Teyana, Michelle Jackson, and Nina Simone Moore–grew up in different parts of the country with different upbringings but all have similar stories to tell. 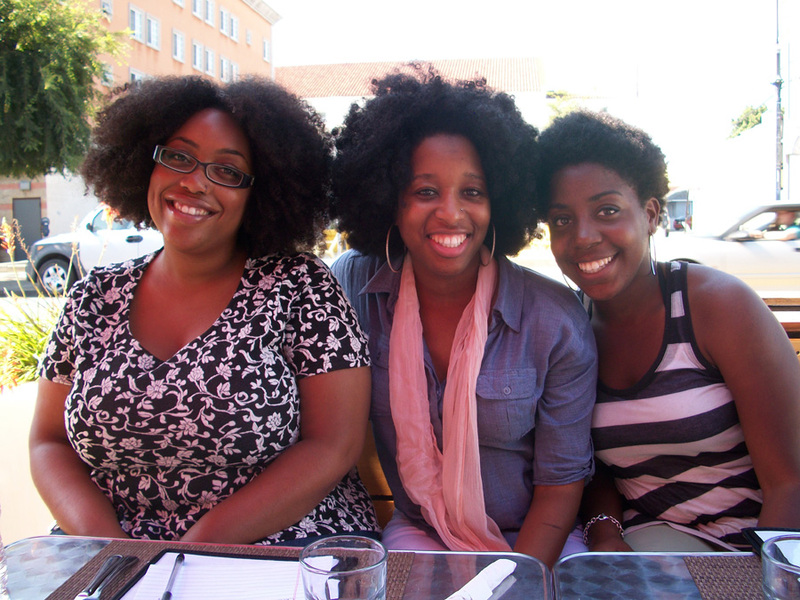 Stories about self worth, a woman’s physicality, the complexities of being a woman of color. These three dynamic women intend on raising awareness and open dialogue about the objectivity of womens’ bodies and their experiences as black women in America in their upcoming poetry show-slash-play, A Necessary Body. In addition to an IndieGoGo campaign that will end tomorrow at midnight, the trio will premiere A Necessary Body in September at Shades of Afrika near Downtown and Anointed D’va Boutique in North Long Beach. What was the writing process like creating A Necessary Body? Ideas that stuck to the wall? KT: I think as black women we are taught to be really strong. We don’t take the time to care about our bodies because we got to do so much and take care of so many other people. [It was] A bit of challenge to sit down and say: “How do I really feel about my breasts? How do I really feel about my thighs? Are these things that bother me? Are these things that I’m proud of? Are these things I like about myself?” I think as women in general we’re always taught to focus on the things we don’t like about ourselves like my thighs are too big or my [breasts] are too small instead of really embracing those things as good and to love those things and be proud of them. MDJ: It’s not surface level. I think a lot of times [the perception is] really easy to talk about the body like, “I’m a woman and I just love myself.” But sometimes you don’t always love yourself and so we really took the time to explore all of that. Why do you feel that your play is necessary? MDJ: We took a break [at a recent writing retreat] and started watching Love and Hip-Hop: Atlanta. I think that made me realize why our show is so important; seeing [programming] like that about black women in the media. [The media doesn’t] have many positive portrayals and positive representations of black women. We’re going super deep and also celebrating our connection. It made me realize how important what we are doing and how we’re relating to one another. KT: I have a younger sister and I definitely want to be an example…[I tell her] you are beautiful just the way God made you…so for me it has always been a goal to be a positive influence to younger black girls. NSM: It’s been a long time since I’ve been on stage and speaking about something I actually feel connected to. This is not just for YouTube. We are actually trying to open up dialogue discussions about what it means to be black women pretty much with in the U.S. I like the concept of being able to get up spark a dialogue once you get off stage. How will A Necessary Body create a forum of discussion about the various topics presented in the play? KT: [The focus is] to uplift other women, but also to teach our men it’s okay to tell a woman that she’s attractive, it’s not okay to objectify her. It’s taking responsibility of what we will accept and what we won’t accept in reference to our bodies and our being around other people. MDJ: We’re human we get stuck in routines and patterns. [Perceptions, taboo’s, etc.] all come from things that have existed for a long time. We are a part of this system that has created this and we [women] have participated in some way, whether we want to or not, whether or not we acknowledge or not. It’s not only that women in love and hip-hop are the problem, or men are the problem, we all are in the puzzle together. NSM: You don’t have to take other people’s opinions [to heart], just keep it moving. How important are female role models? MDJ: Women role models are important and just not women role models but sisters. If we are to celebrate women, we need to be reaching out to woman. NSM: You have key players in different parts of your life. My friends have been most influential when it comes to the development of my character. What about stereotypes? Is it that people/media, etc. just don’t know that they are perpetuating stereotypes? KT: I think it’s a combination of people choosing not to know. I think it’s also the images of black women in the media. Because I don’t look like Beyonce or because I don’t act like girls on these reality TV shows, I don’t fit into any of these boxes and people don’t really know how to respond to me, and even within our own community. Every day we leave our house we are constantly fighting against these media images. MDJ: The whole of society needs to be retaught about all things. We need to see Latina women and Latino men in a certain way, we need to learn to see white people in a certain way. It’s just not an American thing, it’s really strong in America in a way that’s strong nowhere else, we put people in these boxes and we never ever let them leave. Any life philosophies learned through this process? Any inspirations for those who are doing the same kind of work being social justice through the arts? Being an artist in general? MDJ: You don’t have to wait to live your life as an artist and to work as an artist you just have to be willing to work and don’t stop working and don’t stop seeking inspiration, and questioning, and breaking down things, so you can build them back up in a different way, just constantly be in the doing of it and find community. KT: We can be influential to our community and hopefully other people will see they had a thought, they had a conversation, they had some meetings, the put something together and they were able to create this show. I can do that. NSM: I would say that anything you want is not going to be easy. That you’re actually going to have to work for it. People let fear hurt them in very obvious ways and in very small ways. We’re not waiting around for anything, we’re taking it. Go take it!